Eliminating noise, weight and wear proves valuable in 2012. The complete Product News section from the March/April 2012 issue of Gear Technology. The complete Technical Calendar from the March/April 2012 issue of Gear Technology. 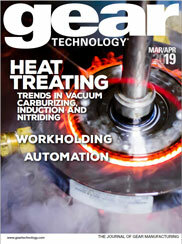 The complete Industry News section from the March/April 2012 issue of Gear Technology. Faithful Addendum readers are accustomed to finding upbeat, whimsical and oddball stories about gears in this space. What follows is not about gears, exactly. Rather, it is, as opposed to the usual bleak news about America losing its manufacturing mojo&mdash;a look at a positive, hopeful development in that regard.